Valuable knot usually used for securing loads or tarpaulins. Form a bight in the standing end and use it to tie a Directional Figure 8 Knot. Pass the tail round the hook below and through the Directional Figure 8 Loop, and pull tight. Complete the knot with two Half Hitches below the loop. Thank you: We really appreciate the huge increase in the number of visits to this page due to the release of the Trucker's Hitch Video on September 3rd 2014 by Ylvis, creators of the wildly popular song What Does The Fox Say? Use: The Trucker's Hitch (Power Cinch Knot, Lorry Knot, Haymaker's Hitch, Harvester's Hitch) (ABOK # 2124, p 344) has the distinctive feature of providing a mechanical advantage when being tightened. The variety of names for this hitch is a tribute to its widespread use. It is a valuable knot - particularly for securing loads or tarpaulins. Real Truckers: The Animation was prepared to show the structure of the knot. In practice at step 6, a Real Trucker will pass a bight of rope through the loop and then use the bight to tie off the knot with half hitches. This allows him to use one long piece of rope to tie many Trucker's Hitches. 3:1 Purchase: The arrangement of line provides a theoretical 3:1 purchase. However, rope is running over rope with considerable friction. In practice the mechanical advantage is much less, may be more like 1.6:1. However, hauling on the line can be surged and then the friction is an advantage as it helps hold the gain while the end is secured. The theoretical 3:1 gain assumes that the lower attachment point is fixed and the upper point is being moved. Structure: There are several variations in widespread use. The common factors are: a knot to create an eye at the top; the three to one purchase; and a hitch to secure the end. 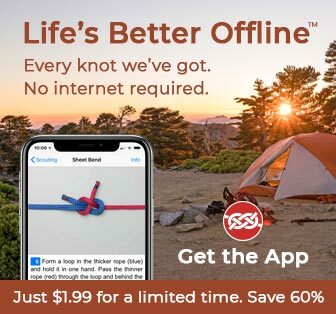 Several knots may be used at the top including the Directional Figure 8 (used in the animation, the Slip Knot, the Bowline on a Bight, the Alpine Butterfly, and, simplest of all, a mere twist of the rope to create the loop. Finishing with a Rolling Hitch has the advantage that it facilitates adjustment. Whichever hitch is used, the rope may be passed around the lower hook a second time before being secured. Classical Structure: Early descriptions show a Figure 8 Loop used to form the initial loop. However, this tends to be hard to untie after heavy loads and the version in the animation is preferred. Taking the Strain: After the free end is threaded and tightened, the load can be taken temporarily by pinching the rope where it passes through the loop. The other hand is then used to form the two Half Hitches.